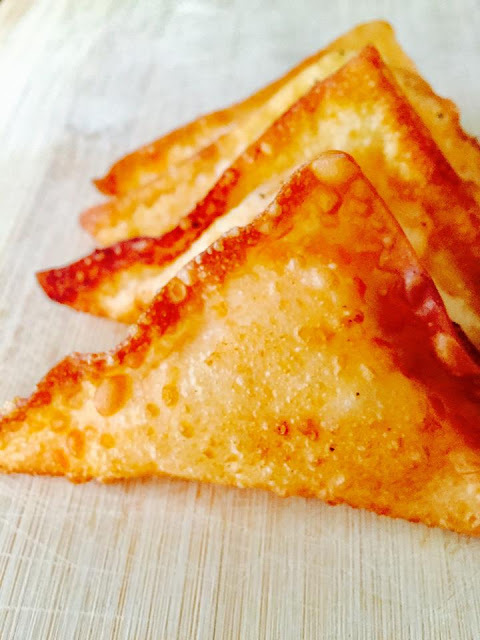 This buffalo and blue cheese combo wrapped and fried in a wonton is one heckuva hors d'oeuvre to share with guests! This recipe idea came from a slight variation to kitchenswagger.com 's amazing buffalo chicken rangoons. I have always loved the traditional, sweet cream cheese rangoons from Chinese restaurants but have not put much though into adding other stuffings into wontons. What a mistake! I tried this recipe and decided to add a little variation to Kitchen Swagger's recipe. I love the blue cheese buffalo combo and I figured it could not go wrong in these fried wontons, and guess what...I was right. I could not get enough of these and decided to make a dessert variation (that will be added to the blog later). Enjoy these and thanks Kitchen Swagger for sharing the great idea. Fill sauce pan with water (enough to cover chicken breast) and bring to boil. Place chicken in boiling water and cover pan, and lower heat to medium output. Remove chicken after 15 minutes in pan and ensure that the chicken has been cooked through and then shred with two forks or hand blender. Place shredded chicken to bowl, and add cream cheese, onion powder, garlic powder, buffalo sauce, and blue cheese. Mix until creamy and all combined well. Fill deep sauce pan with an inch or so of vegetable oil and place oil on medium-high heat. Dip finger in water and wet wonton edges. Add a table spoon of stuffing onto middle of wonton and fold square into a triangle over the stuffing, and then seal the edges. Place several wontons at a time in hot oil and let cook for around 15-20 seconds on each side until golden brown. (They will burn quickly if not turned over in time! ).